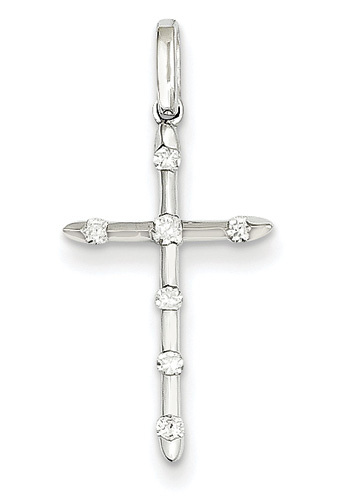 A diamond cross necklace is staggered with 0.14 carats of white diamonds in 14k white gold. Cross measures approx. 13/16" tall (1 1/16" tall with hoop) x 1/2" wide. Diamond Color: H-I color and Clarity: I1. View our collection of women's cross pendants. We guarantee our Staggered Diamond Cross Necklace, 14K White Gold to be high quality, authentic jewelry, as described above.